Looking to withdraw from your retirement portfoilo? Read more about why the 4% rate is the magic number, plus the pros and cons to doing so. 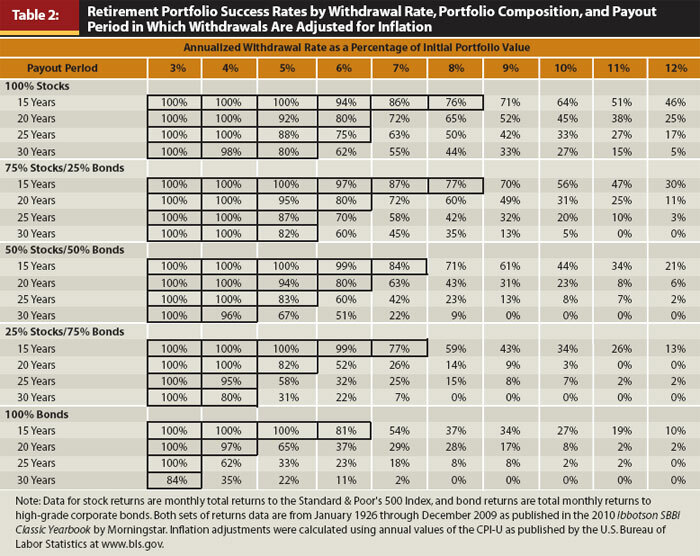 In retirement planning, the concept of the 4% safe withdrawal rate is a well-known metric for the approximate percentage of a portfolio you can withdraw over a 30-year horizon with the expectation that the portfolio will still be there at the end of the 30 years. It’s based on a study of three finance professors from Trinity University (San Antonio, not Dublin) where they recorded the effects of a range of nominal and inflation-adjusted withdrawal rates applied monthly on the success rates of retirement portfolios of large-cap stocks and corporate bonds for payout periods of 15, 20, 25, and 30 years. They updated the study in 2009. In other words, they looked at hundreds of historical 30-year periods and measured the success rate of different withdrawal rates on different equity/bond allocations. When looking at 30-year periods from 1926 to 2009, they found that a 75%/25% allocation between stocks and bonds produced a 100% success rate with inflation adjusted monthly withdrawals at 4%. This is the most important chart from the study. That means you could withdraw 4% of the initial portfolio balance each year, adjusted upward for inflation, with a 100% success rate for a portfolio divided between equities and bonds at 75%/25% . Example 1. Larry has a $1 million portfolio in 1952. He withdraws $40,000 in year 1, $40,760 in year 2, $41,045 in year 3, etc. increasing with inflation (the early 1950s were a low time for inflation). He has a constant stream of $40,000, adjusted for inflation, at least until 1982. Despite the popularity of this study, surprisingly the 4% safe withdrawal rate not well-known outside of retirement planning circles. There are a few important considerations to keep in mind when relying on the 4% safe withdrawal rate. Thirty (30) year periods. The study measured retirement periods of thirty years. That will take a 65-year-old through the age of 95. But what about people retiring earlier? If you’re a lawyer that plans on stopping work at age 55, can you rely on the study for a retirement that could stretch 40 years? Also, as people are living longer and longer, do you want to take a risk that your money could run out in your mid-90s during a state of life where you won’t be able to work? The validity of the Trinity Study is highly debated in early retirement circles where people are planning on living on money for 50 and even 60 year stretches. Portfolio Success. Tying into the point above, the Trinity Study considered the portfolio to be a success if on the last day the portfolio had zero or greater dollars. In other words, you could drain the portfolio down to the bottom on the 364th day of the 29th year and the study deemed the portfolio successful. If you’re a little concerned about getting that close to the bottom, you might be skeptical of the 4% withdrawal rate. Past Data. All the analysis is based on past data. Nobody knows how the market will perform in the future. Understand that this undermines the people who argue that the Safe Withdrawal Rate should be higher or lower too. Low Rate. A 4% withdrawal rate doesn’t seem that extreme when you realize that you could withdraw 3.33% annually of a portfolio consisting entirely of cash and expect it to last 30 years (X/30 = 3.33%). Granted, this would be using nominal dollars which would result in a important decrease in your standard of living over the 30-year time horizon, but the 4% withdrawal rate is a fairly conservative number (i.e. that’s why they call it the safe withdrawal rate). In many of the 30-year periods, a 4% withdrawal rate resulted in a significantly higher portfolio balance at the end of the 30-year periods. You could very easily end up with more money than you started! There’s also a bunch of articles that are pessimistic about future equity performance and recommend moving the safe withdrawal rate to a lower number (usually 3%). There’s something about the safe withdrawal rate that attracts people who love to play with numbers. EarlyRetirementNow is putting on a tour de force of technical calculations on the fallacy of the 4% safe withdrawal rate. If you’re interested, I highly recommend reading through his excellent series. You’ll learn a lot about the 4% withdrawal rate and why it’s ridiculous to approach it dogmatically with the expectation that you’ll be able to withdraw 4% each year. I’m not sure where he’s going to land on a true “safe withdrawal rate” but presumably it will be much lower than 4%. Ironically, his article has reinforced my belief that the 4% number is fine for planning purposes. First, you should understand that the math behind the rule makes it very simple. All you need to know to figure out your “number” is take the amount of income you would need to cover your current living expenses and multiply it by 25. Example 2. Larry makes $50,000 a year. He pays $10,000 in taxes and lives on $40,000. He needs approximately $1,250,000($50,000 x 25) to retire. If you’re like most people, that number might seem a lot lower than you thought it would be. Can you really retire on $1.25 million? To others, you might be thinking that $40,000 is an impossibly small amount to live on in retirement. The truth is that every study I’ve read shows that overall expenses go down in retirement. Sure, you may travel the world for a couple of years or buy a boat, but you can only keep that spending going for so long. After taking three international trips a year for five years, you might start to prefer hanging around the house. We also know that when you have more time, your spending is likely to decrease as you rely less and less on paying higher prices for convenience items (pre-made meals, cleaning services, etc.). Second, you should keep in mind that the 4% safe withdrawal rate is just a guide. No retiree in their right mind is going to calculate 4% of the initial portfolio amount and withdraw it consistently (adjusting upward for inflation) each year. Without fail, every actually old retired person I’ve spoken to has told me that some years you withdraw a little more when the market is good and some years you withdraw very little when the market is bad. Here’s a great takedown on the Bogleheads about the complexity vs simplicity when it comes to SWR. The biggest criticism is that the poster retired at the beginning of a great bull market and was therefore able to withdraw much more than 4% in retirement. But it’s insane to me when people make calculations assuming a 1995 retiree would have kept on spending through 2007-2010 as if everything was fine. People are not automatons! Which means, if Larry from the example above has $40K in fixed expenses each year that he cannot change, retirement is going to be a little more dicey. If he has $20K in fixed expenses but another $20K in variable spending, he’ll have the flexibility he needs to get through the rough patches. I could write about a host of other reasons why the pessimists shouldn’t carry the day on calculating retirement spending (perhaps a subject for a future post). Calculating 25 times the income needed to cover your current annual expenses is a perfectly reasonable starting point for figuring out your number. Once you calculate your reasonable expenses in retirement, your “number” might be a lot lower than you think. Let’s talk about it. Join us over at Lawyer Slack to discuss with other lawyers (always fun to discuss in real time) or leave a comment below. Are you using the 4% safe withdrawal rate as a rough guide for your own retirement “number”? Hi–how do you join Lawyer Slack? I’ll send you an email about it. Mind sending me one too? Thanks for sharing the link Matt. It’s a good read and you’re right. If you’re spending $30K a year today, it certainly would be hard to cut down in retirement. But the good news for the early retirement crowd is that you multiply 25 times your expenses, so if your expenses are already low then your “number” will have that baked in. But you’re right, if you are relying on 4% and can’t cut your expenses any lower, it could be tight. The biggest flaw I see in the criticism of using the 4% as a planning guide for early retirees is that I think there’s an almost zero chance that you don’t earn some form of income in “retirement”. If you quit working at 40 and are comfortable living on $40K a year (let’s say you have a $1M portfolio), it seems highly likely to me that you’ll end up doing something that involves some sort of compensation. Sure, you might sleep till noon and travel the word for 5 years but what about the 40 years after that? So again, I think it’s missing the forrest for the trees if someone convinces themselves that 4% isn’t safe enough and so continues to work at a job they don’t love. Have faith in yourself! Someone who saves up a $1M by age 40 isn’t the type of person that is going to run out of money at age 75 because they over-consumed. Totally agreed with your last point; that’s why I pulled the plug from my demanding career as soon as 4% covered my relatively frugal living expenses. Sure, we may want the freedom to splurge in the future, or we may need more income if there’s a prolonged market downturn, but there’s no way I’m going to just “veg” for the next 40 years without earning some income. Also, when your expenses are relatively low, a small amount of income makes a big deal in withdrawal rate. I could cover a lot of my living expenses just pouring beers part-time at a neighborhood brewpub. Great points. I often hear about the Trinity study and the 4% safe withdrawal rate when I read about the early retirees. With your example of the 55 year old attorney…I don’t think that extra 10 years will make a difference. I do wonder about the extremely early retirees in their 30s/40s who will have to stretch it much further. I think Matt makes a good point about reduced spending in retirement for those who are already frugal. And back to the extremely early retirees, it is a little more difficult to predict your expenses when you’re in an earlier stage in life (especially when kids are involved). Exactly. It’s impossible to predict anything in the future. All we’re doing is modeling and making a best guess. To me it’s a disconnect to think that people thinking about these kinds of issues worry that their money won’t last. The very fact that you’re concerned means you’ll be a good steward going forward. 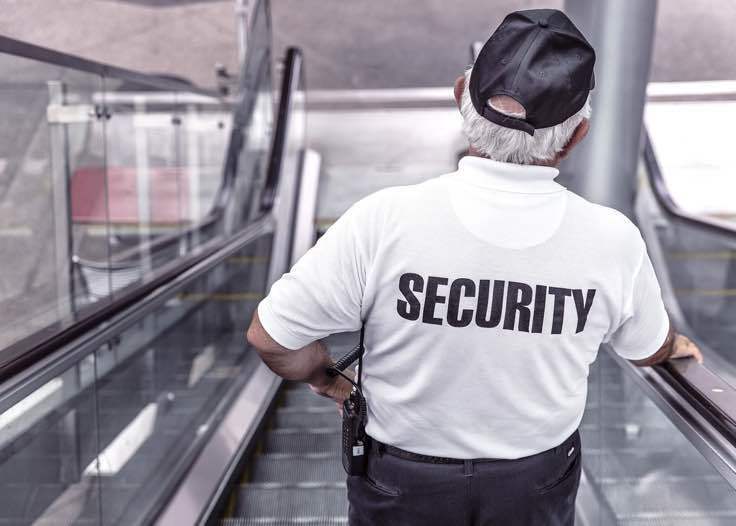 If the market doesn’t perform well, you may indeed need to return back to work but it might be of the $20K-a-year-part-time variety rather than the current day job. Plus, I didn’t say this in the article, but lawyers are particularly insulated from this problem since you can use your law degree for the rest of your life. I would think it much harder for a 55-year-old middle manager at a Fortune 500 company to get back in the industry than for a lawyer to return to part time work. Depending on when I decide to retire will probably influence my decision regarding the 4%. If I am forced to retire before I intend to then I probably would use a smaller percentage. If I know that I’ll have a pension and social security to lean back on then I might increase the percentage. But I really enjoy the different perspectives on the subject. This sounds exactly like most people that have retired (whether early or not). You don’t rush into retirement purchasing the boat and three around-the-world vacations. You ease into it slowly. I think the much bigger concern should be what are you going to do with your time in retirement. People want to be happy and finding yourself without purpose and no “job” can be more emotionally devastating than I think people realize. The 4% rule is good enough for me. No withdrawal rate will be 100% safe, but 4% withdrawal rate is safe enough for me with standard withdrawal strategies, and you can always switch your withdrawal strategy if the market declines. If I recall correctly, the average retiree who withdraws 4% will end up with more than double their money at the time of their death. I agree. You hit on all the important points. No withdrawal rate is 100% safe. To think otherwise is silly. People aren’t automatons. They will adjust strategies depending on macro and micro conditions. And everyone ignores the fact that there’s an equal chance you end up with twice as much money. Over 30 years, which is my likely scenario, I agree with ERN. Simply put success over thirty years could be you have one hundred dollars left. The thirty year periods are mutually exclusive, and the second period for me would start somewhere after normal retirement age. I.e. I would not want to live on for percent from 40 to 70 only to find myself hosed from 70 to 100. Thanks for the comment FTF. I can only react with an emphatic No Way! The chance of you ending up with $100 on your 70th birthday is nil. Nada. Zero. Unless you have a fundamental belief that once you stop working at age 40 you are not allowed to engage in any income producing activity, it just ain’t gonna happen. Not to someone that was smart and focused on savings during their early income producing years like you. And that’s not to say that a lot of things can go wrong. The market may not perform as well going forward as it has previously. You might end up with a serious medical condition. The sequence of returns risk is serious and potentially fatal. Life is full of risk. But, I’m not aware of anyone advocating a “set it and forget it” plan to retirement (early or otherwise), which means that even if you settle on a 2%, 3% or 6% withdrawal rate, you will need to reevaluate as things go forward. Life happens. I think people should have more faith in themselves to make appropriate course corrections, particularly if they’re young when it’s much easier to re-enter the workforce. One issue I’ve seen with safe withdrawal rates is when folks set 4% of the original portfolio as the baseline and then adjust that upwards for inflation every year. That has a very real failure rate compared with just withdrawing a flexible amount. This topic just never gets old! I agree with your take on the 4% rule (unsurprisingly, since I am an optimistic person) . There is also the cost to take into account if one decides to go with 3% (or something lower than 4%) – the cost of time and opportunity. Shouldn’t one try to put a price on the extra years it would take to go from 4% to 3%? I know that if I was 90 and sitting on a portfolio way, way larger than necessary I would probably regret the 5-6 extra prime years of my life it took me to get there – time away from pursuing my passions, the childhood of my kids that I missed, the travel opportunities etc. The 4% rule completely changed my approach to retirement planning. Huge fan – thanks for spreading the word!